Happy Thanksgiving from America’s greatest college town, Athens, Georgia. Home of the University of Georgia Bulldogs, the famed UGA Arch, which is modeled after the state seal of Georgia and the Waitin’ Since Last Saturday podcast with Scott, Tony and Will. How’s that for a humble introduction? Thanksgiving means one thing for the Georgia Football team and its fans. Clean, Old-Fashioned Hate. It means it’s time to put up with those Georgia Tech Yellow Jackets from Atlanta. So, in the spirit of this year’s matchup, I wanted to try to help define what the Georgia vs Georgia Tech rivalry means from a University of Georgia fan’s perspective. For some college football teams, there is one, maybe two weeks circled on the calendar when the fanbase gets a little more amped because of a rivalry game. For the University of Georgia it comes in waves throughout the year. Quick obvious geography lesson here, but Georgia is bordered by five states and four out of those five states have an SEC conference team in it who the Dawgs play every year - and all are rivals of the Dawgs to some degree. Should the Georgia football team want to have a championship season, victory in these particular SEC games are critical. In most seasons, UGA has to face off versus South Carolina and Tennessee in the months of September and October, both pivotal matchups where the pecking order of the SEC East is typically established. Then comes late October and November when Florida and Auburn come calling. By mid-November the bar is established. Either Georgia has vanquished these teams, like they did in 2017 and 2018, placing them atop of the SEC East standings or the Dawgs have struggled and have a mid-level bowl game to plan for. More and more recently, Georgia even schedules a big-time non conference game like they did in 2017 when they beat Notre Dame 20-19 in South Bend, Indiana. There was a mutual respect for tradition and prowess on the football field when that game took place. Notre Dame will be on the Dawgs’ schedule in 2019 as they visit Athens, Georgia for the first time ever. Add in the possibility of both Georgia and Notre Dame meeting in this year’s college football playoff and one could argue that a short-term rivalry would exist for a three year span. Even the Alabama Crimson Tide, a school that Georgia has only played 11 times in 28 years is a rival. In seasons where the Tide and the Dawgs do not play on the gridiron, they are still going head-to-head in recruiting wars. Georgia and Bama continually vie for the top players in the nation year in and year out. Despite the pain that Alabama has inflicted on the Dawgs recently, there is a mutual respect between the two schools and fanbases, but not to an obsessive level. The Dawgs and Jackets will play for the 115th time on Saturday. There is no doubt that a rivalry of some form exists for these two in state universities; UGA and Tech are separated by 60 miles and have played each other every year since 1925. But there’s something Georgia Tech fans should know. Georgia fans don’t care about the rivalry as much as you do. We don’t really think about Tech until it’s time to play the game. Does it hurt to lose to Georgia Tech? Absolutely. But lucky for us that has only happened 3 out of the last 17 years. You see, there is build up of importance to South Carolina and Tennessee. The Florida and Auburn games are discussed and analyzed weeks, if not months in advance. Georgia fans have even been talking about and worrying about playing the defending national champion Alabama Crimson Tide in the SEC Championship game for a month now. The Dawgs are competing for championships, Georgia runs a pro-style offense. Georgia signs four and five star recruits and often ranks in the top 5 of recruiting rankings year in and year out. Since bragging about wins on the football field doesn’t work out for them, Tech fans have long reveled in boasting about the far superior academics standards and prestige of their institute. Yet, much to the Trade School’s chagrin, the University of Georgia has gained significant ground on Georgia Tech in the latest U.S. News & World Report Best National University Rankings. So, that tired old meme from Tech fans stating that “Georgia grads will be employees for Tech grads” is pretty laughable now. My two co-hosts, Will Leitch and Tony Waller have brought up this line from “Mad Men” on multiple occasions throughout the years referring to Georgia Tech. You can hear them reference it again in our latest episode - it never gets old. It might be the best, most succinct analogy of how Georgia football fans feel towards their long-suffering Georgia Tech friends and neighbors who like to celebrate how UGA is their biggest rivalry even when they’re playing another team. That’s pretty dumb, isn’t it? At a Georgia Tech vs Clemson game earlier in the year two Georgia Tech fans passed in the concourse of Grant Field, Bobby Dodd, Mark Richt Stadium. One fan asked, “What’s the good word?” To which the other replied, “To hell with Georgia.” Then, like an archaic fraternity challenge the first fan says, “How bout them Dawgs?” The other fan, like a trained lemming responds, “Piss on ‘em”. (Yes, these are actual programed sayings Tech fans say to each other). Georgia was playing a game in Columbia, Missouri on that September day a full two months before Tech and Georgia were set to play. Why were two Georgia Tech fans so obsessed about the Dawgs back then and not more concerned about their football team trying to compete with the #2 ranked Tigers? It’s kind of sad if you ask me. He would yell, 'To hell with Georgia!' like his daddy used to do. Georgia fans insert the name of the opponent who they are playing that day at the end of the fight song. Georgia fans don’t obsess over one singular team. I have belabored this point, but it was a point that needed to be made. Georgia Tech is a rival to Georgia, but UGA has many more important rivals. Georgia wants to win every single time they play versus Tech and as I pointed out earlier, the Dawgs are pretty good at winning the majority of the matchups. There is nothing greater than stealing hope from Georgia Tech fans as my podcast co-host, Tony Waller likes to state. I’m glad Georgia and Georgia Tech play football every year despite the fact that their offense is hard to prepare for, they teach questionable cut-blocking techniques and when Tech does win it can put a damper on the season. But the main idea of this piece is to inform the uninformed (and obsessive Tech fans) that the University of Georgia runs this state, doesn’t have time to preoccupy themselves over the Tech rivalry and there’s not anything Georgia Tech fans can really say or do to one up UGA fans. In closing, I’ll admit Georgia Tech fans are proud of their school and diplomas as they should be. 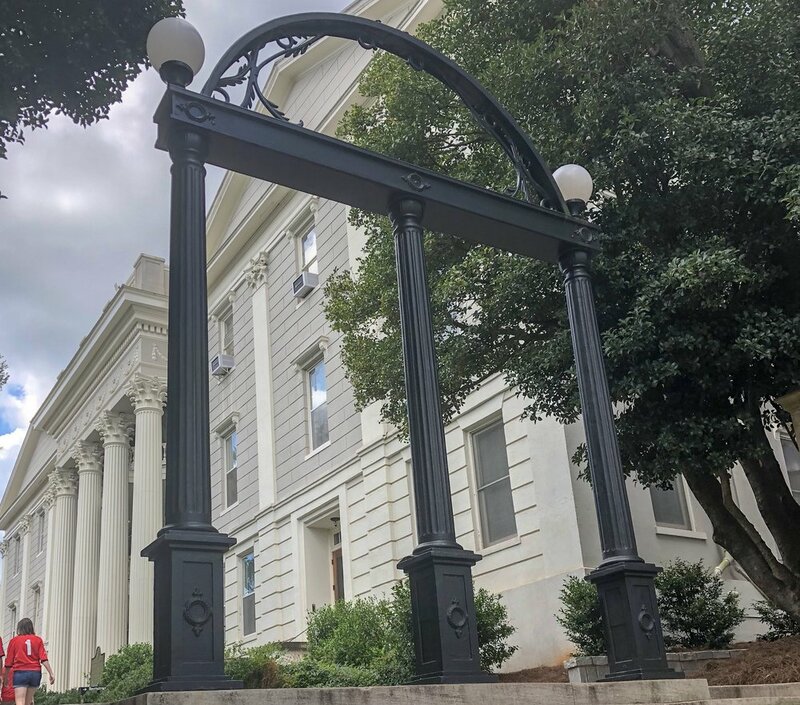 In fact, they should frame them and study them intently because if they they look closely, they’ll notice the famed arch embossed right on their diploma, yes that same UGA arch representing the state seal of Georgia. The arch which also serves as the welcoming landmark to the University of Georgia - the state’s flagship university. Georgia Tech alumni can proudly display their arch diploma and it will serve as a reminder to obsess over their friends in Athens but to also know deep down that the obsessive feeling from Georgia fans is definitely not mutual. Scott Duvall is a contributor and producer for the Waitin’ Since Last Saturday podcast. Check out the Georgia vs Georgia Tech preview podcast with Scott, Will Leitch and Tony Waller here. Special thanks to Ian for pointing out the arch in a recent Tweet to the show this week.